the art and science of pure flower and plant essences is the core of aveda. our beauty products are alive with the life force of plants, and contain pure essential oils. our solutions are so powerful we call them purescriptions™. while we specialize in hair care, we offer other plant-based products—skin care, makeup, pure-fume™, aromas and lifestyle—that are all professionally developed, clinically tested, and go to exceptional lengths to be respectful of the earth. our professional network, nearly 8,000 salons and spas worldwide, shares our commitment. ever since a hairdresser founded aveda in 1978, our products have been harvested with respect for the earth, in harmony with the web of life. At The Cat's Meow Salon and Spa we take our alliance with AVEDA and it's mission very seriously. Besides using their products we practice other environmental initiatives in our daily work. We reduce waste by measuring our colour products by weight on a scale and recording our formulas. Not wasting colour means it does not end up in our sewer system or landfill (even though it is 97-99% naturally derived!). It is also better for our bottom line, which means you are also getting more value for your money! We recycle everything we possibly can! Paper, plastic, colour tubes, aluminum foil, even the hair we cut. We reuse whenever we possibly can. We are sticklers for cleanliness and sanitation but we are ever mindful of repurposing what we can before it becomes garbage or recycling. We use natural cleaning products whenever possible (Health Canada requirements aside). Again, better for the environment, better for you! We cut our tubes of product to make sure it is good to the very last drop. This is an excellent trick to use at home too! At Aveda, they believe there is no responsible alternative to doing business other than through the pursuit of environmental sustainability and this belief guides every decision they make. They find inspiration for doing so in nature and believe that nature is not merely something to be cherished and protected, but also should be emulated as a model of sustainability. They also believe that profit and environmental responsibility will increasingly work together as more industries find out that "nature works" for both sustainability and the bottom-line. 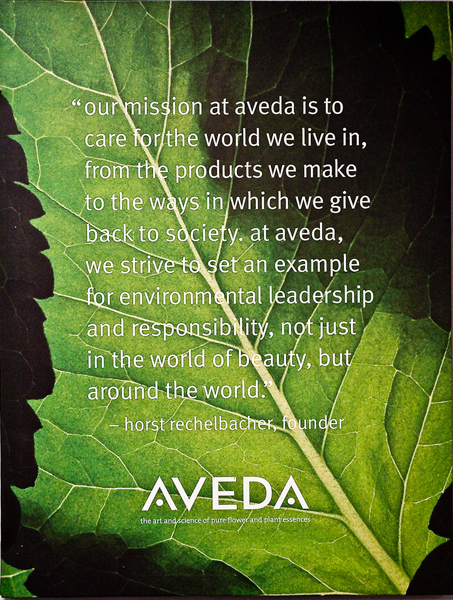 In support of our mission "to care for the world we live in" Aveda has embraced the Cradle to Cradle (C2C) concept and philosophy as a key element of acting responsibly. Over the past decade, we've partnered with nonprofit organizations whose work supports our commitment to social and environmental improvement. AVEDA Corporate Headquarters is the first beauty company to use 100% Wind Power at their manufacturing facilities in Minneapolis, Minnesota. We are proud to have been the first beauty company using 100% post consumer recycled PET. Now more than 85% of our skin care and hair care styling PET bottles and jars contain 100% post consumer recycled materials. First prestige beauty company to combine PCR and bioplastics in a plastic tube. In 1989, we were the first privately held company to sign the CERES Principles (Coalition for Environmentally Responsible Economies). Today, we continue to strive to improve our practices and commit to publicly sharing our results.